Full Moon Farm Board and Volunteers have been working tirelessly on our new website for over a year and we are extremely proud to announce that it is finally ready! 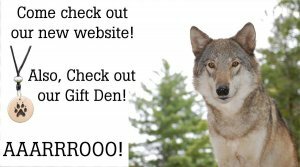 You can see pictures and bios of all our resident wolfdogs and click right on their photo to sponsor them! We hope you like the fresh new look. This year pick a loveable wolfdog as your "Howlentine?" Choose from some of our most adored wolfdogs or wolfdog couples to be your very special Howlentine. 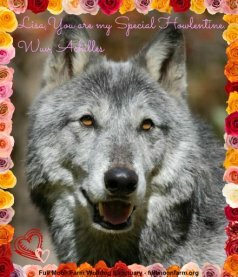 For a small donation you will receive a personalized electronic valentine with a picture of your favorite wolfdog or wolfdog couple to share with your friends and family members & put on Facebook. All proceeds go to directly to Full Moon Farm to support our 56 resident wolfdogs. Click here to pick your Howlentine. Limited Edition! Full Moon Farm Hoodies! Valentines Day is just around the corner, and It's not just puppy love! 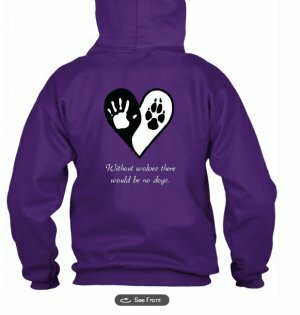 Whether you're in love with dogs, wolfdogs or wolves this cozy hoodie says it all. Because.... Without wolves there would be no dogs, and that's the truth.Help us reach our Goal of 50 sold so we can give the wolfdogs a super Valentine's day and support the wild wolves in their time of need by creating awareness. Click here to get this limited edition hoodie now! Only available for 1 week.